Start with a beer and some pickle fries at the restaurateur’s latest in Ballard. You won’t be sorry. 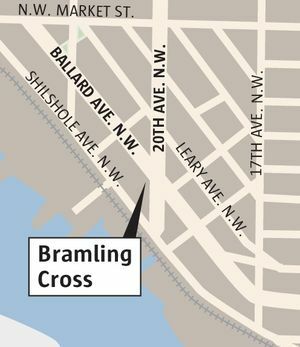 With Bramling Cross, Ethan Stowell Restaurants continues its march up Ballard Avenue. The restaurant opened last September in the former Portalis space, within a couple blocks of sister restaurants Ballard Pizza Company, Staple & Fancy and the soon-to-open Marine Hardware (formerly Chippy’s). Named after a British hop said to have “a distinctive American aroma,” Bramling Cross is rather the reverse: an American-style gastropub with a distinctly British air. More tavern-ish than Stowell’s Goldfinch Tavern downtown, Bramling’s interior is an appealing set piece, classy and clubby, with dark walnut tables and pale, painted wood moldings that partly obscure the building’s original brick walls. 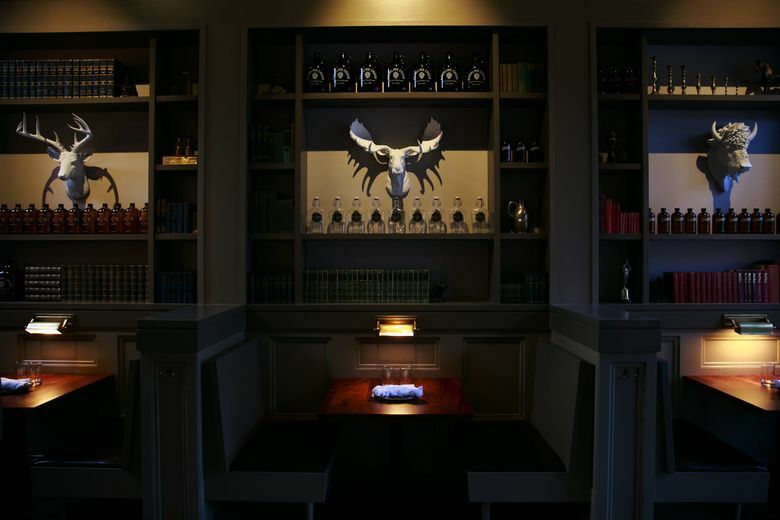 Ghostly white, faux taxidermy peer out over tidy shelves displaying sets of vintage encyclopedias and growlers monogrammed with the pub’s initials and crest. Hours: dinner Sunday-Thursday 5-11 p.m.; Friday-Saturday 5 p.m.-midnight; brunch Saturday-Sunday 10 a.m.- 2:30 p.m. The food is as polished and smart as the room. It’s rich, robustly seasoned fare, well-matched to beer — or booze in general. There are plenty of brews on offer — many, but not all, local — as well as creative house cocktails. The wine list, culled from Europe and the Northwest, has much to offer in the $50-and-under range. Start with an order of pickle fries. To be clear, these are not fried pickles, but dilly fried potatoes. Compound that with pickley aioli and you have a dream team. 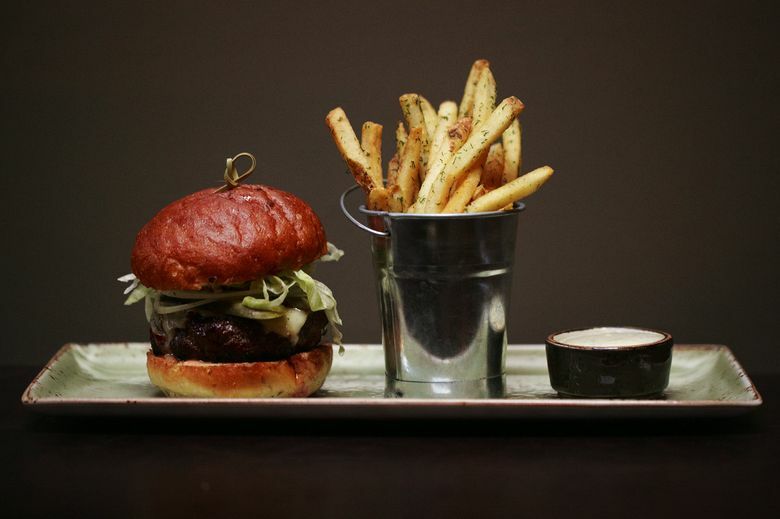 For a little extra you can swap pickle fries for the regular fries that accompany the towering Bramling burger. That plump, juicy, American-cheese-draped patty comes preloaded with crunchy house-made pickles. More pickle juice punches up the aioli brushed on the soft, toasted Macrina Bakery potato bun. Another killer combo. 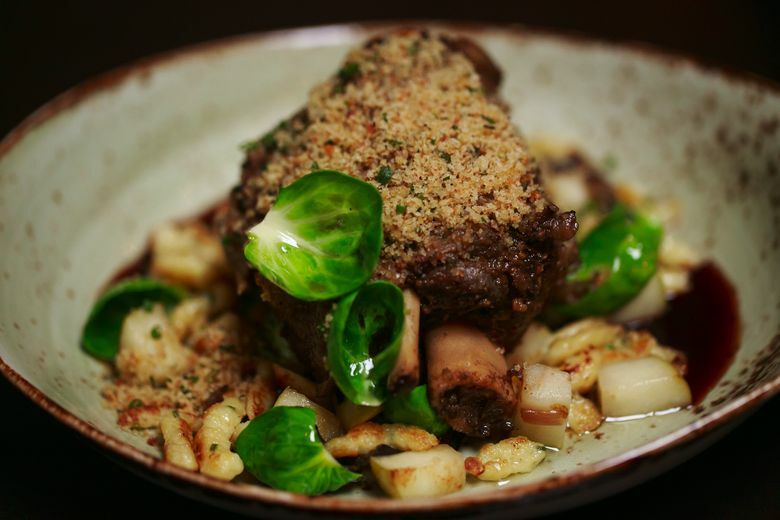 So is pork osso buco with Dijon spaetzle. The mustard adds a subtle kick to the nubbins of dough, lightly sautéed to a golden brown. The hefty shank of meat gets a rubdown with herbs and spices, then a long simmer in pork and duck fat, until it needs little nudging with a fork to fall into moist shards on the plate. 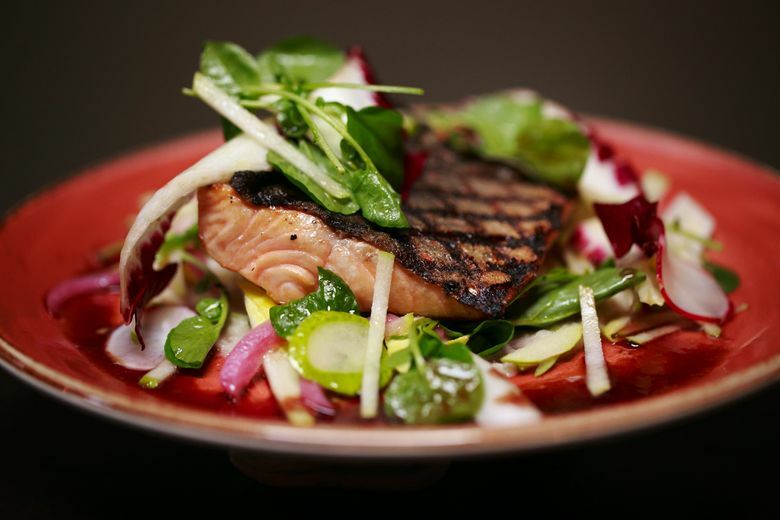 On the lighter side, a red wine demi paints circles around a perfectly grilled Arctic char fillet, cushioned on white bean puree beneath a glorious salad of chicories, radish and pear. Another salad of beets, beluga lentils and watercress, dressed in sherry vinaigrette, provides sharp, earthy counterpoint to lightly smoked Idaho trout with horseradish crème fraîche. Caramelized cauliflower gets all dolled up with tangy yogurt, sweet sultana puree and a dusting of dukkah, a pungent spice blend that tastes most prominently of hazelnuts, cumin and coriander. “Seattle hot wings” are lavished with Frank’s Red Hot. They’re fried oysters, not chicken, and it would be a clever conceit, if the heavily breaded bivalves didn’t taste like fishy chicken nuggets. The real fried chicken is aptly dubbed “dynamite.” It’s a whole Mad Hatcher Farm bird, cut into eight pieces, each with a dark-brown jacket that makes a resounding crunch. The dark meat is almost as pale and juicy as the boned hunks of breast meat. The package deal for $38 includes a side of grits flooded with butter and collards slow-cooked with bacon and vinegar. Props to the server who brought fresh plates and silverware before the chicken’s arrival, and wiped the table clean before dessert came. Throughout the evening, she was personable and informative, thoughtfully addressing food and beverage questions. On a different night, service was less engaging, more cursory. If you have the bravado to order dessert, consider the cast-iron baker of warm chocolate-chip cookie topped with salted chocolate gelato. The banana split could use a redo: I’d ditch the mushy, flambéed fruit, keep the peanut brittle and the surprisingly good beer gelato, maybe add some chocolate sauce, and call it a sundae. Meanwhile, Gifford, who worked with Stowell at his first restaurant, Union, and who returned to the fold to help open Ballard Pizza Company, is moving down the block to Marine Hardware. Word is he’ll share that kitchen, at least some of the time, with the boss. A deep bench, and the ability to attract talent and deploy it among his 11 restaurants, is a key to the 41-year-old Stowell’s success. It’s one reason he was recently named — for the second year in a row — one of 20 semifinalists for Outstanding Restaurateur in the nation by the James Beard Foundation.